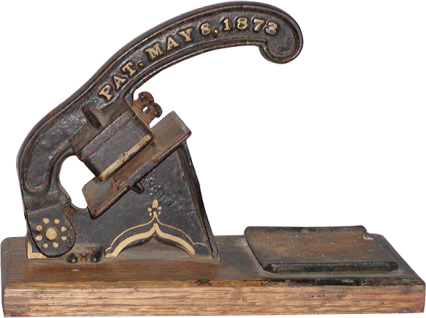 This tiny press, patented in 1873, is the smallest in the line of Kelsey presses. An ad for the press in an undated catalog reads, “For the boys who simply wish to print cards, or others who only desire to print a few lines . . . All iron and steel and does good work . . . ” See Excelsior Model P for more information on Kelsey’s presses.